Canadian Stage presents Canadian dance sensation Crystal Pite’s Dark Matters at Toronto’s St. Lawrence Centre for the Arts. Even though I’m not any sort of expert or aficionado when it comes to modern dance, I’ve been looking forward to seeing Dark Matters by Kidd Pivot Frankfurt RM ever since Canadian Stage announced it as a mid-season replacement for another show. The draw for me was Canadian choreographer Crystal Pite. I’m a fan of Pite’s from her previous works I’ve seen; last season she provided the brilliantly integrated choreography and movement design for Canadian Stage’s Studies in Motion and I was lucky enough to see her stunning modern dance pieced inspired by insect swarm theory Emergence performed at the National Ballet. I find Pite’s choreography inventive and contemporary and the way she uses dance to explore broader themes is fascinating and intelligent. Dark Matters seemed to be a natural progression for Pite. The dark matter of the title has a double meaning. Physicists hypothesize that dark matter makes up over 80% of all matter in the universe but since it doesn’t emit or scatter electromagnetic radiation (i.e. light) it can’t be seen. However, its presence has an enormous influence the gravitational force of astronomical objects. Pite extends the dark matter concept and uses it as a metaphor for the lives of everyday people, her work ponders the effect that unseen forces can have on the human psyche. Pite refers to the piece as an exploration of the unknown. Dark Matters consists of two distinct pieces performed by seven extraordinary dancers: Eric Beauchesne, Peter Chu, Sandra Marín Garcia, Yannick Matthon, Jirí Pokorný, Cindy Salgado, Jermaine Maurice Spivey. The show opens with a vignette between one of the dancers, Peter Chu, and a wooden puppet manipulated by four of the other dancers. The ninja-like puppeteers are dressed in blacks, they’re hooded and their faces are completely obscured. At first the interactions between the postmodern Geppetto and his puppet creation are cute and funny but their relationship quickly devolves into something more sinister. 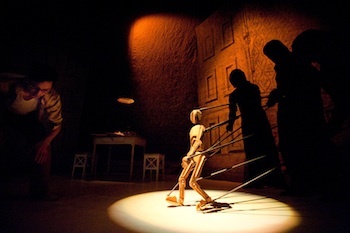 I was really amazed at the skill and sheer coordination of the four puppeteers as they brought the little wooden man to life and enabled him to perform the complex range of movements that is integrated into the choreography of the piece. After the intermission, the company does away with all the puppets, props and scenery and presents a purely dance-driven piece. A sole hooded ninja from the first part serves as a connecting element while the other dancers appear in typical, everyday attire. For this second piece Pite expands on the themes and furthers the vocabulary of movement from the first; she references the mechanical movements of the puppet throughout the choreography. When the dancers perform in pairs or in groups they often appear to be manipulating each other like puppets. The original music by Owen Belton is minimalist and atmospheric often making use of sound effects. One of the most interesting passages is danced to the sounds of paper being crumpled. Though the second piece is more abstract the precision, control and athleticism of the dancers kept me totally engaged throughout the hour-long performance. Not only was it thrilling to watch but my brain kept churning away thinking about the deeper meaning behind the movement and how it related to the dark matter theme. Dark Matters is in turns cerebral, visceral and sheerly physical. Pite uses dance as a means to explore grander concepts but at the same time the movement and imagery she creates is evocative and often spectacularly physical – making for a thrilling evening of modern dance. Peter Chu and company members in Dark Matters. Photo by Dean Buscher.